Tertiary education colleges across the UK are issuing more and more debt. The lack of an insolvency framework means any default would be messy, but lenders reckon the government would probably prevent a default. With demand for degrees waning, the bet may soon be tested. 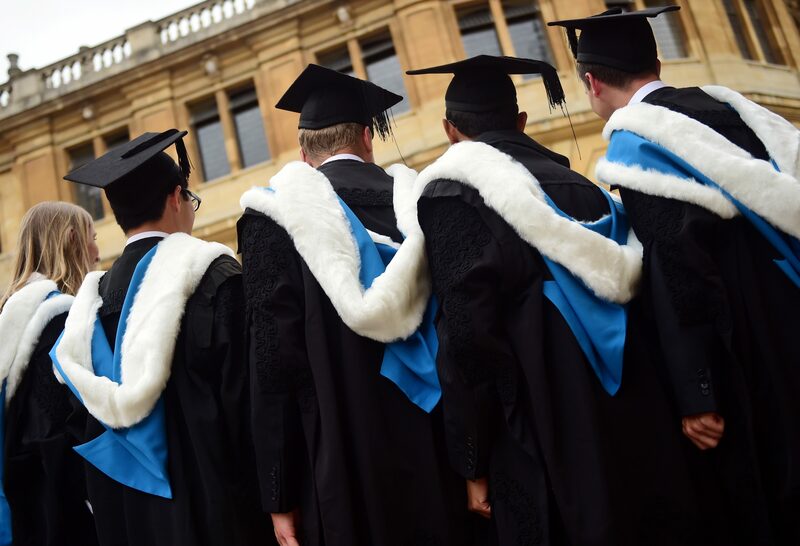 Graduates pose for a photograph outside the Sheldonian Theatre after a graduation ceremony at Oxford University, in Oxford, Britain July 15, 2017. University debt has trebled over the past decade to 12 billion pounds, much of which has come through private placements, according to a report from capital markets publication IFR. Edinburgh, Glasgow, Bath, the University of East Anglia and dozens of others have borrowed billions in private placements from Babson Capital, now called Barings, MetLife and Northwestern Mutual among others over recent years, IFR added. British newspaper the i reported on Nov. 1 that at least three universities are on the brink of bankruptcy, with growing numbers resorting to short-term loans “just to survive”. A university in the northwest and two on the south coast of the UK are facing serious financial difficulties, with one already in talks with insolvency lawyers, according to the newspaper.